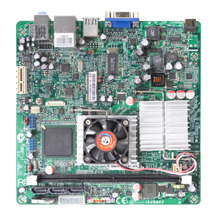 170mm x 170mm (6.69inch x 6,69inch) mini-ITX Small Form Factor platform. Height less than 50mm (1.96inch) slim designed to fit any mini-ITX chassis. Energy saving designed with 90W (i945GCt-DN) or 65W (i945GCt-SN) adapter. Low power consumption designed with Intel® Atom™ CPU. i945GCt-SN : Intel® Atom™ 230 single core CPU with 533MHz FSB. i945GCt-DN : Intel® Atom™ 330 dual core CPU with 533MHz FSB. Intel® 945GC+ICH7 chipset with integrated Intel® GMA950 graphics engine. Supports DIMM DDR-II 533MHz memory up to 2GB. Supports 5.1 channel high definition audio output. Provides one PCI-Express x1 and one mini Card slots for function extension. Provides three SATA 2.0 connectors for internal hard disk or optical drive.